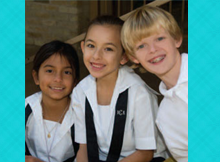 “For us to best serve each child that attends our school, we need to know everything about him or her,” says Margaret Ann Casseb, director of admissions at St. Luke’s Episcopal School. A committee will review the information and make a decision. In addition to academic qualifications and other considerations, the goal is a good fit. “We’re looking for someone who is going to be successful in this environment,” Casseb says. Now, says Klaftenegger. “If you’re thinking about it, do it now, don’t wait until summer of next year,” she says.